The AquaMon base station serves as the central collection point for sensor data. Data is collected from local and remote sensors and stored in the base station on-board memory. The data is then packaged for transmission and transferred to the secure web server. The remote sensor nodes transport sensor data to the base station through a 900 MHz wireless network. The 900 MHz radio on each sensor node can communicate with a base station or repeater node up to 2 miles distant. If the site requires longer range between the sensor node and base station or terrain reduces the usable range, relay nodes can be added to the network to extend the network reach. The base station collects sensor data from its own sensors and the remote sensor nodes, formats the data, and stores the data in its on board memory. At intervals set by the grower the base station transmits the collected data to the secure web server via a cellular based, GSM modem. Once loaded onto the web server, the sensor data can be monitored from any laptop, tablet, or smart phone with Internet access. The base station can also receive messages generated by the RSVP web software in response to alarm conditions or configuration changes. When such messages are received, the base station can use the 900 MHz wireless network to send the appropriate commands to the sensor node. Cermetek offers four models of the standard base station. The differences in models reflect variations in how the base stations are powered. For installations with available AC power, the base station can be selected to operate on AC Power with a 12 volt adapter plugged into a standard 120 Volt AC outlet. Optionally, a battery backup can be included to allow base station operation to continue during a power outage. In locations where AC Power is not readily available, the AquaMon base station can be selected with battery power as the primary power source. In this configuration a solar panel is available to maintain the battery charge. The base station can also be configured to accept direct sensor inputs. In this configuration the base station can support both the remote sensors and locally connected sensors. The sensor interface boards used are the same as those used in the remote sensor nodes and standalone systems. 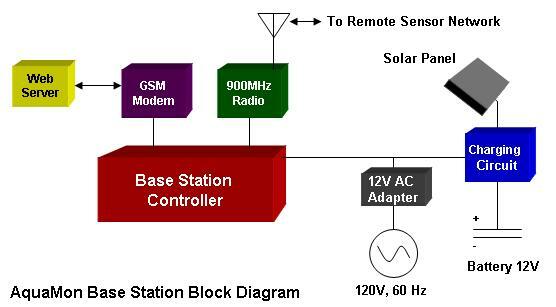 Base stations with direct sensor inputs have the same options as do the standard base stations including AC power, AC power with battery backup, battery power, and battery power with a solar charging system.